Kuwini is a fruit of South East Asia. This fruit has never been found in the wild. Botanists are of the opinion that kuwini has originated as a hybrid between Mangifera indica and Mangifera foetida. Kuwini has a very unique feature. Its tree emits a charaecteristic fragrant resinous smell. Even the flowers of this tree are strongly scented with the same fragrance. That is why this species has been named M. odorata. This fruit is commonly cultivated in Borneo, Sumatra and Java. It is also found in Thailand, Vietnam and Guam Islands. 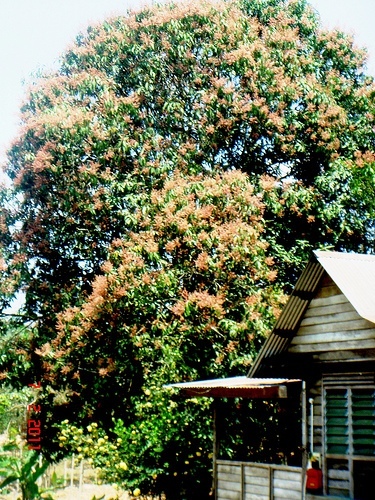 A Medium-sized tree, 10-15m high, rarely exceeding 20m height; crown globose or broadly ovoid; bole straight, bark grey, containing irritant sap. Leaves irregularly scattered on rather thick branchlets, oblong-lanceolate, 12-35cm x 4-10cm, coriaceous-chartaceous, edge not wavy, shortly acuminate, with prominent reticulated veins especially on the lower surface, not or hardly odorous when bruised , petiole 3-7cm, swollen at base. Panicles terminal, pyramidal, 15-50 cm long, rather densely flowered, rachis yellowish-green tinged with reddish-brown; flowers 5(-6)-merous, ca. 6 mm wide, fragrant; sepals ovate,3-4m long, brown-red or partly green; petals lanceolate, ca. 5-6 mm x 1.2-2 mm, yellowish at the base, pale pinkish towards the apex, reflexed, with 3-5 fingers on ca. 2/3 of the length of the petals, confluent at the base, pale yellow becoming dark red; stamens5(-6), only 1fertile,filament 5 mm long, staminodes 1.5-2mm long; ovary subglobose, yellowish, style excentric, 3.5 mm long, dark red. Fruit an obliquely ellipsoid-oblong, hardly flattened drupe,10-13 cm x 6-9 cm, green to yellowish-green, sparingly spotted with dark brown lenticels; rind rather thick(3-4 mm);flesh orange yellow, firm, fibrous, sourish-sweet, juicy, with a pungent smell and taste turpentine. Stone 8-10 cm x4.5 cmx2.5-3 cm, covered with rather soft fibres; seed frequently polyembryonic. The fruits, especially those which have less fibre and also do not have much characteristic resinous, are much appreciated as table fruit. They must be peeled thick because of the presence of an acrid juice in the skin, which can also be reduced by steeping in diluted lime-water before eating. About 70% of the fruit is edible. Per 100g edible portion the fruit contains; water 80g, protein 0.9g, ash,0.6g, carbohydrates including fiber 18.5g, ash 0.6g, B-carotene equivalent 0.36mg, niacin 0.7mg, and vitamin C13 mg. The energy value is 290kj/100g. The fruits are also used for making chutney and for pickles with salt. In Java a kind of flour is made of the seed kernels and used in the preparation of delicacies such as ‘dodol’ (based on glutinous rice) and ‘jenang pelok’ (a thick pappy preparation from Curcuma rhizomes). 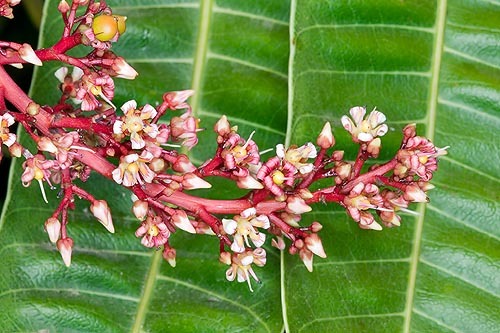 The bark of kuwini tree is recommended for external application in hysteroepiepsy, in the form of a compound like a cosmetic mixture. 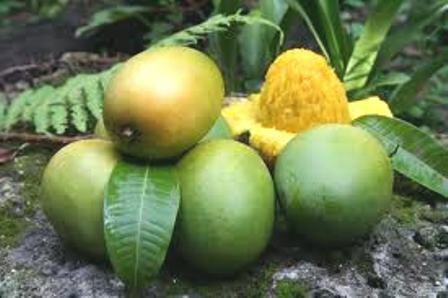 The wood is similar to that of the mango. 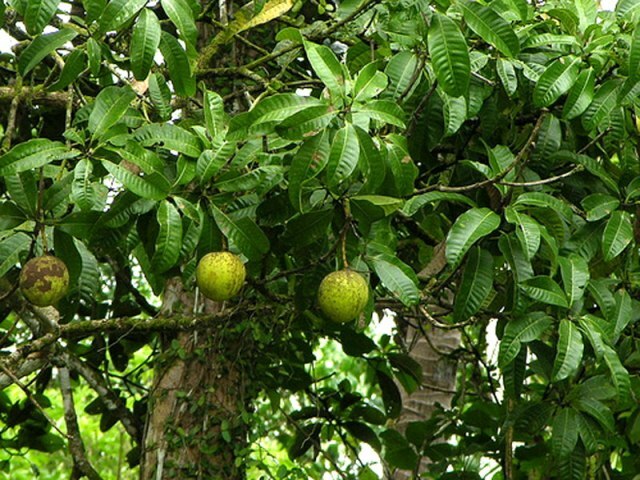 The Kuwini is a popular fruit, having local economic significance in areas where Mangifera indica L. cannot be grown satisfactorily because of excessive humidity. It doers best thrivesin tropical areas below 1000 m. The rainfall should, however, be good (over 1200 mm) distributed equally throughout the year, although it grows even with a moderate rainfall(1200mm) provided there are no prolonged dry periods. New plants of kuwini mostly raised from seed, only rarely by grafting. Air layering does succeed but the results are poor and hence not followed. Budding proved to be successful, but where M. indica was the scion, symptoms of incompatibility developed after two years. Planting distance is 12-14 m.
This fruit is usually planted in home gardens and village orchards alongwith other fruits. It is a dominant fruit tree in some villages specialized in kuwini production near Solok, West Sumatra, where vegetables or bananas are grown under the relatively light foliage of old trees. The fruits are commonly damaged by larvae of the mango weevil (Cryptorrhynchus gravis), which feed on the flesh and occasionally on the seed. Caterpillars of Philotroctis eutraphera and Noorda albizonalis also bore into the fruit. Kuwini can produce two crops a years in areas where two dry seasons prevail. Kuwini is already a popular fruit in the areas where it grows naturally. Moreover it has the ability to grow in areas of excessive rainfall. So it deserves more recognition and should be promoted even in areas outside South East Asia.